It's vital that your engine operates at a proper working temperature. Car engines can get extremely hot and quickly suffer serious damage as a consequence. Usually located at the front or side of the car behind the fan belt, it's the job of the water pump to squirt water from the radiator to the engine in order to regulate its temperature. Centrifugal force then forces water into the engine block on into the cylinder heads before draining back into the radiator. J&S offer a wide range of Water Pumps compromising over 800 part numbers all sourced to meet or exceed Original Equipment performance. The expansion tank is a vital part of your car's cooling system and acts as an overflow reservoir catching the water/coolant mix that is forced from your radiator as it heats and builds pressure in the system. As you run your car, the temperature of the coolant circulating through the water jackets naturally increases causing increasing pressure in the cooling system. When the pressure builds to a high enough point, the radiator cap allows that pressure to escape into the coolant reservoir through a small hose, called an overflow hose connected by the neck of the radiator to the expansion tank. Most of the coolant is forced into the expansion tank. Located between car engine and radiator, a car thermostat acts as a temperature controlled engine cooling valve designed to keep your engine operating at a safe regular temperature.Car thermostats helps to keep the engine warm, as well as inregulating the coolant to keep the temperature down. By allowing the engine to both warm safely and cool efficiently, the thermostat serves to reduce engine wear, deposits and emissions. 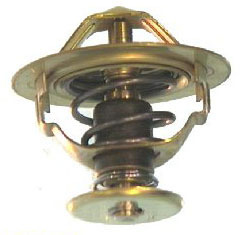 The secret of the thermostat lies in the small cylinder located on the engine-side of the device. This cylinder is filled with a wax that begins to melt at around 180 F (different thermostats open at different temperatures, but 180 F is a common one). A rod connected to the valve presses into this wax. When the wax melts it expands significantly, pushing the rod out of the cylinder & opening the valve. All types of car thermostats for all types of cars are easily and readily available here at J&S. Coolant hoses are essential parts of the total cooling system. They must work year round as the fluid connectors that carry liquid coolant between the engine, radiator and heater. The upper radiator hose delivers hot coolant from the engine to the radiator, while the lower hose returns coolant to the engine.The bypass hose circulates coolant through the engine when the thermostat is closed. Heater hoses carry coolant between the engine and the heater core. Since hoses are so vital to safe engine operation, they should be checked by your service technician before this winter’s driving season.